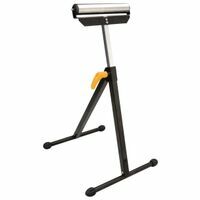 Roller support stand,black shiny finish, with yellow plastic adjustable roller handle. Open range size, 7-1/8" W x 26-9/16" , 42-1/2" H, zinc plated roller, 11-1/4" W x 1-7/8" Dia. x 0.039 (1.0mm), folding size, 29-3/4" L x 17-1/8" W x 2-3/4" H, square feet tube, 21" L x 1-3/16" W x 0.059" (1.5mm), load capacity, 198 lbs. Lightweight and durable steel stand has adjustable height and folds for transport. For use with No.D24000 (770.2525). Add true mobility to your Universal Steel stand. Includes (4) heavy-duty casters. Dual-locking mechanism protects against caster roll and pivot. Includes all necessary hardware. Table saw stand for Worm Drive table saw. The portable jobsite Worm drive table saw stand is made exclusively for (8889081) . Set-up for the job is quick and easy with tool-less latches to secure the table saw. Designed for portability, weighing only 14 lbs. Folds for easy storage. Portable, lightweight and durable. Fits No.DW745 (SKU 281.2428) jobsite table saw.